Postcard showing Dock Road area 1920s? Dee Tickner provided this charming postcard, a view of the High Street with people going about their business. The entrance to the left is Dock Road. To the right is St Paul's Road. The imposing building on the corner of St Paul's Road is the Feathers PH at no. 232. Beyond the Feathers the clock shows where Pearce & Co, watchmakers were based at no. 231. A 'Garage' sign is also visible on this side, and an enlargement shows a BP petrol sign, in the form of the Union Jack with 'BP'roundel added, also there is a Michelin advert. The beehive of the Beehive PH (no. 227) is just visible under the Garage sign. Dating the postcard? The tramlines were laid in the early 1900s. William Langdon, "athletic outfits", is recorded at no. 234 in the 1901 census and no. 235 in the 1911 census, but not in a 1913 trade directory (however traders may have opted not to be included or the Langdon blind may have been retained by a later trader). No. 233 "breakfasts, dinners..." was a coffee shop by 1890 and through to at least 1940. See below for a link to a 1980s photo showing this property, which was known as the 'Feed Well' cafe during the 1950s. The sign on the left outside no. 79 "partition slabs" suggests that Brentford Concrete Construction Ltd (1920 trade directory) had taken over from Edwin Underwood Ltd, hay salesmen & coal merchants (1913). So the southern side suggests a date after 1913. 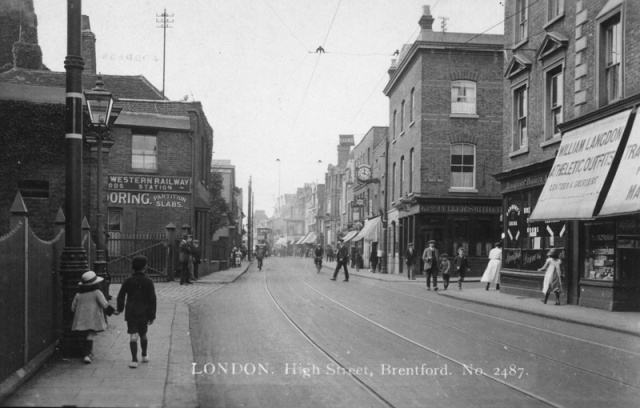 In the distance a tram is visible: this has a closed roof and Dave Stoneleigh has found a note in 'Brentford As It Was': 'opened-top trams were roofed about 1920': suggesting this postcard is from 1920 or later. The fashions may help pin-point the date more accurately. Please contact me if you have any suggestions about the date. There are some excellent photos of this area in the 1980s on the Brentford Dock web site, including views of no. 233 and the Dock Road entrance. More details of the properties and occupants.